We’re almost halfway through this wonderful and wild belly trip. Oh my! I love being pregnant in the winter. Why? Because I am warm! I just starting to feel this little girl punch and kick at me too, it’s like a distant popcorn machine. The peeing never stops. I used to pee on myself when I had a laughing fit. Whatever. It happens. But now, pregnant, forget about it. I’m getting a taste of doing laundry all day for dirty diapers – my own! Oh what dreams may come. I dreamed a comedy family movie from start to finish complete with close ups. In the dream Adam Levine told me to wake up and write it down. So I did! I’m halfway through the script. Yes, I am couponing with Carly. Holyshitballsinheaven, I never thought I’d write that in a sentence. Not only is the kitchen table overrun with my new crafting collection of ribbons, glitter and glue, but I am making our local friends one-of-a-kind snow globes. 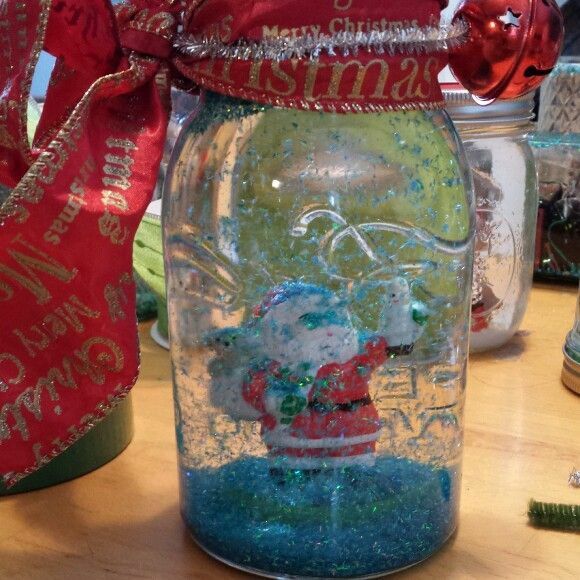 Check out my first Santa snow globe. Am I nesting or what? I’ve even created the registry – oh my a little early, thanks to Alana Joy. It’s not too soon according to my awesome mommy and daddy friends on Facebook who all contributed to a HUGE list of must haves and don’t need to haves. Thank you! We’re doing the nursery in African Safari and my mother in law, quite the artist, is painting a baby elephant, giraffe, zebra etc. Ohhhhh joy. Yes, I will be Pinning that! Oh, I’m pinning too. God help me. Don’t listen to anyone’s advice on how to give birth or parent unless it feels right in your gut. Everyone has an opinion and raising a puppy was only a teeny tiny hint on how people will share how you shoulda coulda woulda. I’m learning to smile and nod and be thankful that my husband and I are on the same page about just about everything. Only three books have rang true for me. The rest I tossed out the window. The Shower, Local and Abroad! My bestie here in town is throwing us a shower, eeeeeeee, but for all of my friends far and wide, I’m thinking we need to do something online with a private video group that I can later show you this child when she arrives. What do you think of that? Although moving to the country was by far the best decision I ever made, second to marrying my high school sweetheart, I sure am missing my friends in far off states and countries. So I’m pondering how to involve you too, and not just on Facebook – as I ponder Pinterest Pin ideas. Lemme know your thoughts and ideas! I’ll do more than smile and nod. HA! Keep the advice coming, I love hearing it! I heard from a few of you that you won’t give me any now, oh lordie beee, that’s not what I meant – I love hearing all your stories and warnings too! I see you in your words just so happy and the biggest smile ever! I am so very happy for you! Your baby girl is lucky to have you and Karl! Incredibly happy for you. The hypnobirthing book was a true lifesaver for me. Without it I don’t think I would’ve birthed my daughter naturally. Good luck with all the prepping. Another book that was great was “when survivors give birth”. Best Wishe! Love this book! Just about done and signed up for classes too. Right up my alley; was raised practicing meditations so this fits like a glove. I am very happy for you Angela.